Heading into Saturday night’s game against Virginia, Duke basketball found itself in a place it wasn’t used to: out of the Top 25. After tough losses to Kentucky, Utah, Clemson, Notre Dame, Syracuse, and Miami, the Blue Devils went unranked for the first time in a decade. Duke’s defense was severely weakened without their senior forward and defensive leader, Amile Jefferson. Jefferson went out with a fractured right foot on December 12. Since then, the team has struggled to stop their opponents and has really suffered on the boards. But with a last-second 63-62 victory over the number-seven Cavaliers, which followed a powerful 72-65 win over number 13 Louisville, Duke is back on the board. The team reentered the Top 25 at number 20 when the latest rankings were released on Tuesday. 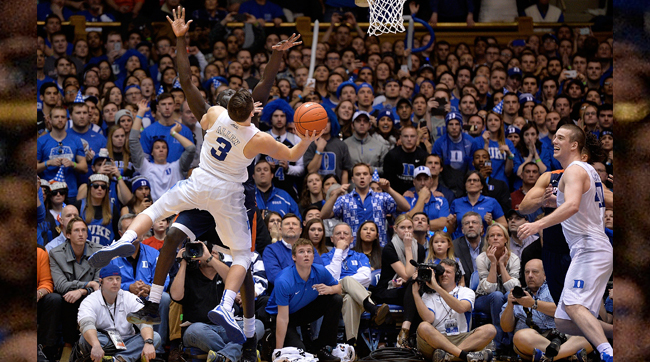 The Blue Devils have its D to thank for getting them back into the Top 25. Duke’s defense really stepped up against Virginia with a goal to prevent Malcolm Brogdon and London Perrantes from hitting any three pointers. While Brogdon finished with a team-high 18 points, he was only 1 of 6 from 3-point range and Perrantes did not get a single 3-point attempt. Blue Devils coach Mike Krzyzewski credited Matt Jones and Derryck Thornton for their excellent work shutting down the Cavaliers' threats. Duke's offense has come to play, too. Grayson Allen and Brandon Ingram provided the firepower the team needed, and they were the high scoring duo in both wins. Against Louisville, Allen had 19 points while Ingram put up 18. And in the Virginia battle Ingram dropped 25 points and Allen added 15 — including the all-important last-second, one-handed, fall-away game winner. Allen and Ingram have been unstoppable, averaging 37.8 points per game combined. It’s interesting to note that among major-conference players, only probable Player of the Year, Buddy Hield, and fellow guard, Isaiah Cousins, from Oklahoma have a higher combined scoring average. 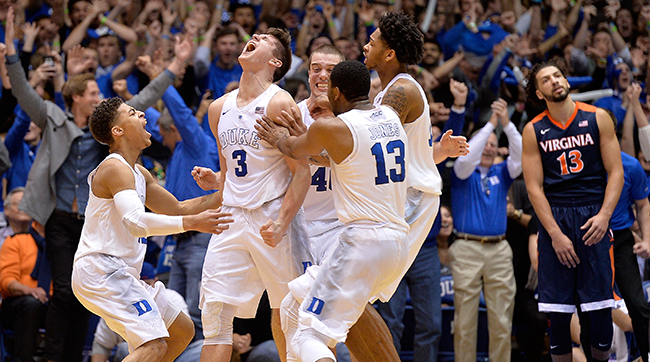 Now that they're back in the Top 25, the Blue Devils can't rest. Tonight, they face their arch rivals number-5 University of North Carolina at Chapel Hill. I can guarantee this will be a game to watch and it could go either way. This has been a crazy and unpredictable college basketball season. Teams like Duke and Kentucky — expected to be on top — have dropped out of the rankings, while number-one teams are getting knocked off almost every week. Only one thing is certain: We are a month away from Selection Sunday, and it will be March Madness!